Markets are full of colors, sounds and life, no matter where in the world they are. Join us as we visit – through images and videos – markets in El Salvador, Mexico, India, Indonesia and Thailand. 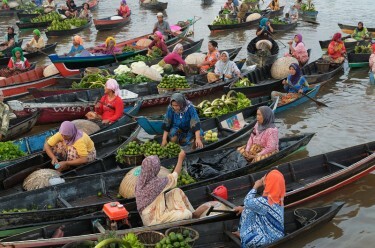 In Indonesia, bartering and selling takes place in the floating market of Lok Ba Intan in South Borneo. MVMTelevisionDigital visited the markets in Oaxaca, Mexico. This one minute clip shows us the colorful places where patrons can buy clothing, jewelry and food including regional delicacies such as grasshoppers and worms, or perhaps a nice warm cup of hot chocolate? This market in Mumbai, India, is slightly different: instead of fruits and vegetables, you can find scavenged auto parts, antiques, refurbished refrigerators and televisions for a fraction of their cost. This 2007 video created by Parasher provides an educational tidbit as to the origin of the name: A tire salesman believes that the market was originally known as “Noisy” market (Shor) but through the English rule the name was corrupted into “thieves” bazaar (Chor). Another vendor chimes in that actually, since stolen goods used to be found readily in the Bazaar, Chor wasn't such a misnomer. A train runs through the Maeklong market in Thailand 8 times a day, and vendors pull up their stalls and clear the tracks every time it passes by. While this may be commonplace for locals, it is unique enough that tourists visit this market just to see the people clear the path of the train.